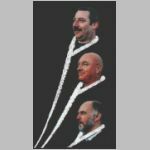 Three Sheets to the Wind are Derek Gifford, Geoff Higginbottom & Keith Kendrick. Individually they have been booked many a night at the Diamond so as a trio you are in for a treat. With songs from the sea the, land and the bit in between sung with joy and a humour. They will plead cajole and even bribe you to join in.